The Vols finally hit the court this week and it’s a season of milestones. Yes, it’s the 10th anniversary of this site, but that’s not what I’m talking about! Head coach Rob Patrick is three wins away from career victory #400, a milestone he could potentially reach this weekend with three matches on the schedule. But there’s one bigger than that too. This is the 60th season Tennessee has fielded an intercollegiate women’s volleyball team. The Vols are the oldest program in the conference by far, with Auburn being the only other team to field a team prior to the 1970s. Also, Tennessee is nineteen wins away from their 900th recorded program win. However, this milestone is not so cut and dried. While Tennessee has had a volleyball team since 1958, results are almost non-existent until 1973, and complete season records are not available until 1978. So while the 900th officially noted win may occur this year, there are many seasons worth of wins and losses not accounted for in the record books. 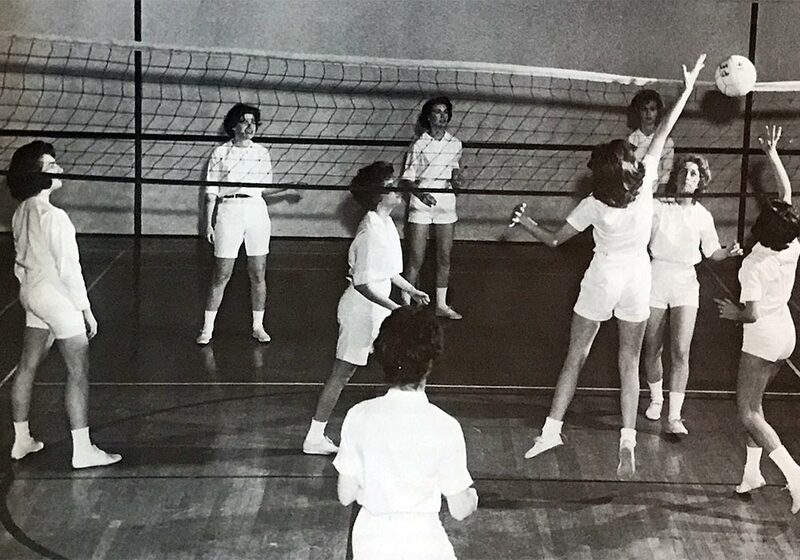 Which begs the question as UT fields its 60th volleyball squad: what happened during those first years between 1958 and 1972 where there is seemingly a black hole of information? While there were some female sports teams representing the school in the very early 20th century, they disappeared in the 1920s. 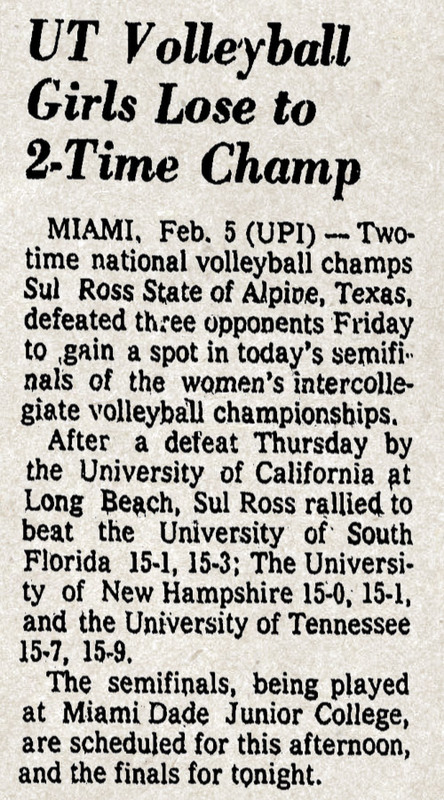 Women’s intercollegiate sports at Tennessee began in earnest in 1958 with a volleyball team. A professor of physical education at ETSU, Connie Mynatt-Axamethy, organized a tournament in nearby Johnson City. 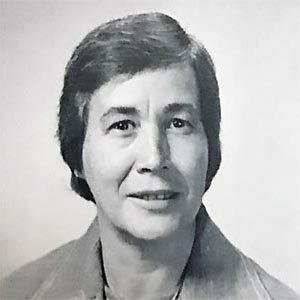 Students at UT learned about it and convinced a teacher in the school’s Department of Physical Education to take them — making Jean Wells the first volleyball coach at the University of Tennessee. The team returned to campus with the first place trophy. The next year, Wells recruited Nancy Lay from the University of Richmond to Tennessee to do her post-graduate work and help grow the fledgling program. Women’s athletics at Richmond were far ahead of those in Knoxville, so it was probably clear to Lay how much work needed to be done. She wasted no time, taking over volleyball in 1959, starting up basketball in 1960, and tennis in 1963. Lay along with fellow teacher Jo Hobson spent most of the 1960s coaching the three women’s teams. Lay led the volleyball squad from 1959 to 1964 while Hobson held the reins from 1965 to 1972. Before we continue, it’s important to understand the thinking of some women’s athletic educators of the time — though bear in mind this is just a very brief summary to give you a feel of the issue but it lacks a lot nuance. Men’s athletic programs similar to how we know them today were well established by this point: think player scholarships, big money, boosters, and an ultra-competitive culture. A growing number of collegiate women’s athletic supporters were calling for parity with the men. But a significant number of traditional supporters were staunchly against it. Not because they were against equality for women, but because they believed that money and the competitive culture it bred had been bad for men’s sports. They wanted to keep the focus for women on education, health benefits, group participation, and building a love of sport. Wins and losses were of little concern in this view of women’s athletics. With no scholarships and no recruiting, educators would be able to focus on teaching the student-athletes already at their university who wouldn’t have to compete for playing time with more skilled players brought in from elsewhere. 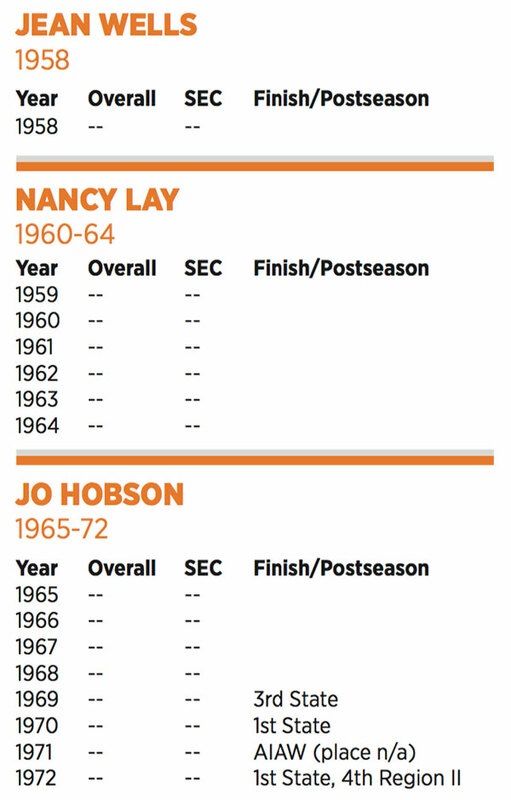 As Tennessee took its first steps at building a program, its leaders, Lay and Hobson, were firmly in this old-school camp. And with the purpose of women’s sports being centered on education, enjoyment, and exercise, things like scores, records, and publicity were inconsequential to them. So it’s no surprise that the Tennessee records books have no data during any of the years they coached. For the first decade of athletics for women things were run by members of the physical education department with whatever equipment was already on hand. With no budget, the teams had no uniforms and couldn’t travel very far. With no dedicated coaches not also doing other jobs, practices were scheduled whenever everyone could get together. And with these same constraints applying to other schools, scheduling was a haphazard affair. 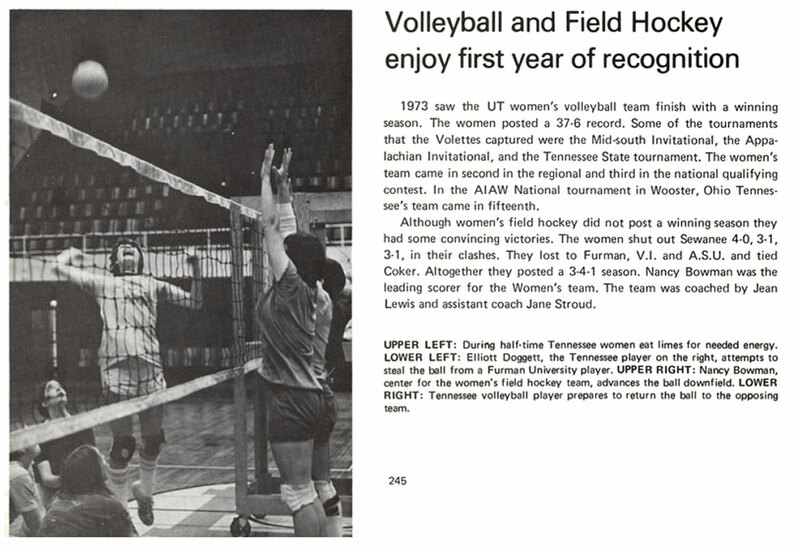 In 1968, women’s athletics at Tennessee were moved from the physical education department to the Division of Student Affairs, home of the school’s intramurals and student-run club sports and recreational leagues. While seen through 2017 eyes this may seem a bit insulting, it was actually considered an upgrade from those in charge of the teams. It took some of the administrative burden off the already stretched thin coaches and physical education department, and the club sports program provided a small budget and help with uniforms and equipment, funded by student fees. With the relative popularity of women’s athletics starting to grow, new opportunities were becoming available. Educators around the state created the Tennessee College Women’s Sports Federation (TCWSF) to help facilitate competition among its members. UT was a charter member and volleyball coach Hobson was named to its organizational committee. Nationally, the Committee on Intercollegiate Athletics for Women (CIAW) was created by the Division for Girls’ and Women’s Sports (DGWS) and began hosting championships for women’s volleyball. This group later became the more widely known Association for Intercollegiate Athletics for Women (AIAW). In 1969, we get few more details. The team played Carson-Newman in Jefferson City on November 12th. Three days later they played in the ETSU Invitational where they defeated the home team, UT Chattanooga, and Carson-Newman, while losing to Mississippi State College for Women and West Georgia. On November 21st, Tennessee competed in the first TCWSF state volleyball tournament in Nashville. They defeated Southwestern 2-0 (15-12, 15-3) but lost to eventual champion Tennessee Tech 2-1 (10-15, 15-3, 18-16). They finished in third place. 1970 was a banner year for the team. October 30-31 they competed in the Appalachian State Invitational in Boone NC. November 6-7 they were in Johnson City for the ETSU Invitational. And November 13-14 they visited Carrollton GA for the West Georgia Invitational. On November 19th, Tennessee participated in the second TCWSF state volleyball tournament, this time hosting in Knoxville at Alumni Gym. The team swept the field — defeating UT Chattanooga, Milligan, MTSU, Southwestern, Tennessee Tech 2-0 (15-3, 14-12), and Southwestern again 2-0 (15-13, 15-3) — to claim the championship. 1971 featured a little controversy and a major milestone. The team defeated Memphis State 2-1 (11-15, 15-9, 15-3) on their way to claiming the MTSU Invitational title, held from October 22-23 in Murfreesboro; participated in the Appalachian State Invitational held October 29-30; and came in second at the ETSU Invitational held November 5-6. On January 15, Tennessee hosted the Smokey Mountain Classic at Alumni Gym. 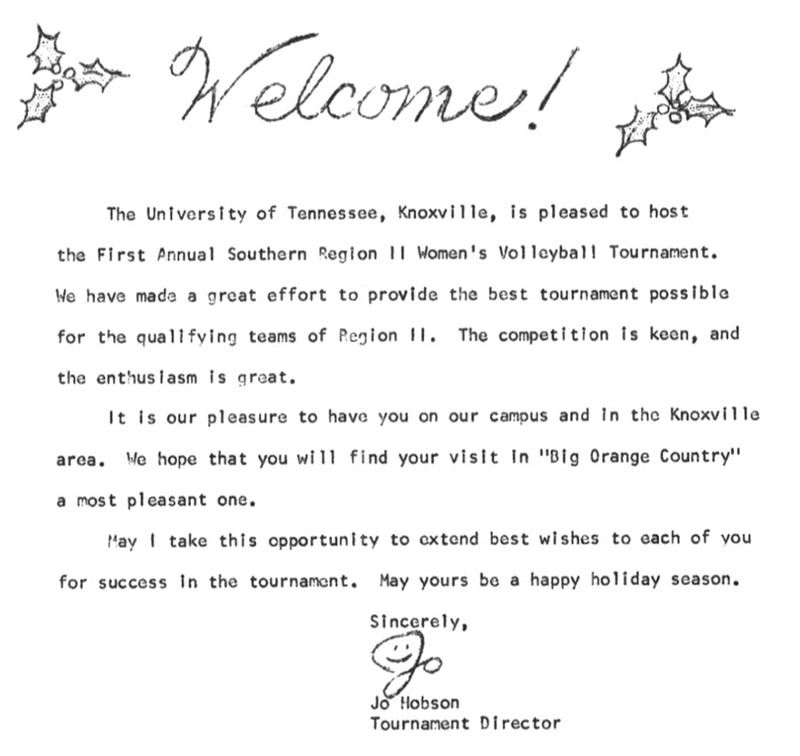 But UT caused some commotion in Tennessee volleyball circles when they decided to skip the TCWSF state volleyball tournament and instead attend the West Georgia Invitational held November 12-13. The team was hoping to get chosen to attend the national DGWS Championships and concluded that their resumé would look better if they could defeat the tougher competition in Carrollton GA rather than their fellow state schools in Memphis. Tennessee won the West Georgia tournament. But the TCWSF was concerned enough about a school skipping their state tourney to reach nationals that they suggested to the national governing body that the state tournaments be made part of the qualifying procedure — a move that was in fact incorporated the next year. Tennessee did earn an invite to the DGWS Championship, making the 1971 squad the first women’s athletic team to represent UT at a national championship competition. But they had to put some work in off the court to get there. Hobson noted the team had to “sell concessions… wash cars and all sorts of stuff like that” to raise the money to make the trip. The tournament was held in Miami from February 3-5 with 28 teams in attendance. Tennessee’s pool consisted of UC Santa Barbara, George Williams College, New Hampshire, Oklahoma State, South Florida, and two-time defending national champion Sul Ross State (who won those championships with the help of one of their coaches Billie Lynn, mother of future Lady Vol coach Sandy Lynn). Unfortunately, not much is known about how the team did other than that they lost to Sul Ross State 2-0 (15-7, 15-9). UCLA went on to win the title. 1972 is the last season for which the Tennessee record books have no match data. It was also Hobson’s last season at the helm. The team came in second at the West Georgia Invitational November 3-4, losing to the home team. They also came in second at the ETSU Invitational, held November 10-11, again losing to West Georgia but defeating the Mississippi State College for Women. At the TCWSF state volleyball tournament, held November 16-18 in Cookeville, along with other unrecorded matches, UT was swept twice by Memphis State (15-0, 15-3; and 15-5, 15-10) before finally defeating them in the finals to claim the championship (15-6, 15-10). That earned the team a spot in the AIAW Region II Tournament, held in Knoxville at the Phys Ed Building from December 8-9, where they would play for a berth in the national championship tournament. Tennessee swept their pool on December 8th, defeating Eastern Kentucky 2-0 (15-11, 15-5), UNC Greensboro 2-1 (15-2, 7-15, 13-9), Coker 2-0 (15-9, 15-13), and Eastern Mennonite 2-0 (15-1, 15-9). That put them in the semi-finals the next day, and with two teams earning a spot to the national tourney, UT just needed a win vs Winthrop to get there. Unfortunately, they lost 2-0 (15-13, 15-10). They also dropped the third place match to Memphis State 2-0 (16-14, 15-7) ending the regional in fourth place. At this point in the record book, things change dramatically. From no results for 15 years, the 1973 season has score details for 44 matches. Five years later, in 1978, complete season records become available for every year to the present day. What changed after 1972? Title IX, which required schools to provide equitable opportunities for men and women to participate in sports — including when it came to things like scholarships, recruitment, equipment, scheduling, travel, facilities, publicity, and support services. Obviously, this was a complete game changer and moved women’s athletics from the “sports for all” model to a more competitive version. And the changes continued. UT raised women’s funding, scholarships finally came to female student-athletes, and (after a bitter feud with the AIAW) the NCAA began sponsoring women’s championships. Old faces left. Lay headed the TCWSF for a year while helping to shepherd the UT program through its growing pains, but eventually she resigned when she felt things had moved too far away from her preferred vision. “I would get all these letters when it came out we were giving scholarships. It was just like buying a piece of meat, at least that was my perception… And I thought, ‘This ain’t for me. This is not my personality.’ I felt very strongly about it and I knew that I could never last…” New faces came on board too, including a 22-year-old with no coaching experience named Pat Head who took over the basketball squad, and a few years later, a former Tennessee basketball player and coach named Joan Cronan who became athletic director. With recognition from the school, a usable budget, more publicity, and a new name, the accomplishments of future volleyball squads were much better documented. So while the officially recorded 900th milestone win might come this year, the somewhat unremarked upon efforts of the women from these first 15 seasons of Tennessee volleyball were the cornerstone that built the program, allowing the 60th squad of Volunteers to take to the court this week with a strong legacy backing them up.